A Hollywood wedding theme simply oozes glamour, chic and glitz, recalling a bygone era of elegant sophistication and romance. The musical choice is pretty straightforward and inevitable – it simply has to be Swing Jazz. No other style of music so completely captures the essence of that magical in between war period: Swing Jazz is synonymous with Broadway and Hollywood. An elegant swing jazz ensemble conjures up a more glamorous and romantic age. Find out more about booking a Hollywood style swing jazz band. Romance is the very essence of Swing Jazz – ‘Isn’t It Romantic?’ was a huge Broadway hit of the time. But, as a contrast to those dreamy ballads, truly balletic ballroom dancing and choreographed routines ( Fred Astaire, Busby Berkeley) were essential ingredients in the lasting success of the Hollywood Musical Movies that exported the smash-hit Broadway Shows from New York to an international audience of cinema-goers – ‘It Don’t Mean A Thing If It Ain’t Got That Swing’. The superb craftsmanship of the songs specially commissioned and written for these spectacular productions, both in terms of their witty yet soulful lyrics and their instant melodic appeal, has arguably never been surpassed. As an antidote to the ravages of the Great Depression, this idealised, suggestive and potently addictive silver screen projection of high-end sophistication and lavish style was eagerly lapped up by a rapidly-growing aspirational middle-class audience on both sides of the pond – the Swing Jazz Era had arrived. 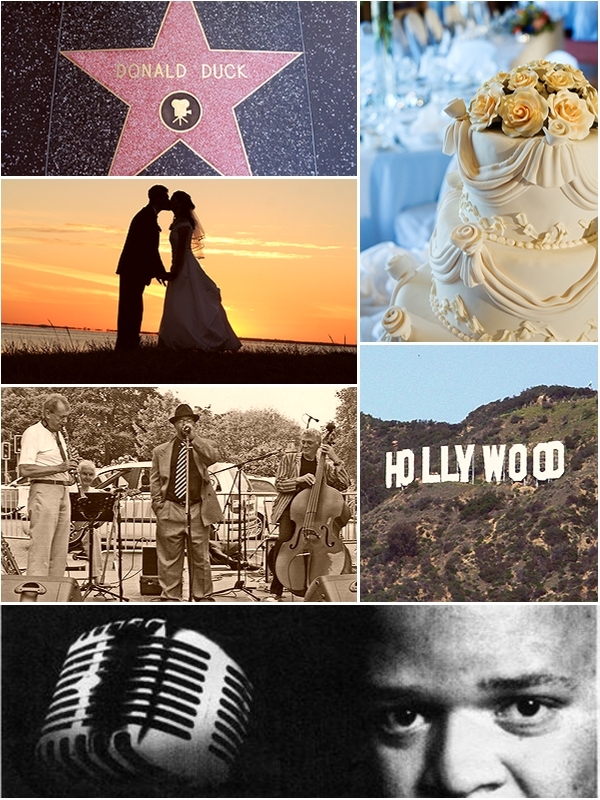 Like Cinderella, you too could be, should be a shining star at your Hollywood-themed wedding celebration. Sumptuous dresses and glittering ballgowns, paired with Top-Hat’n’Tails elegance for the menfolk, are very much the order of the day. Top it all off with a romantic evening of merriment, dancing to the vibrant sounds of a live Swing Jazz Band – even the Ugly Sisters will be won over! Evoke stylish sophistication and add a distinctive touch of vintage class to your special celebration with a Hollywood-inspired wedding theme. The elegant glitz and glamour of the silver screen can readily be recreated through careful choice of venue, decoration and food, and it presents the perfect opportunity to dress up to the nines and feel just like a film star as you dance the night away to the irresistible classics of the Swing Jazz Era – Hollywood’s musical calling-card.